LONG SAULT, Ont. 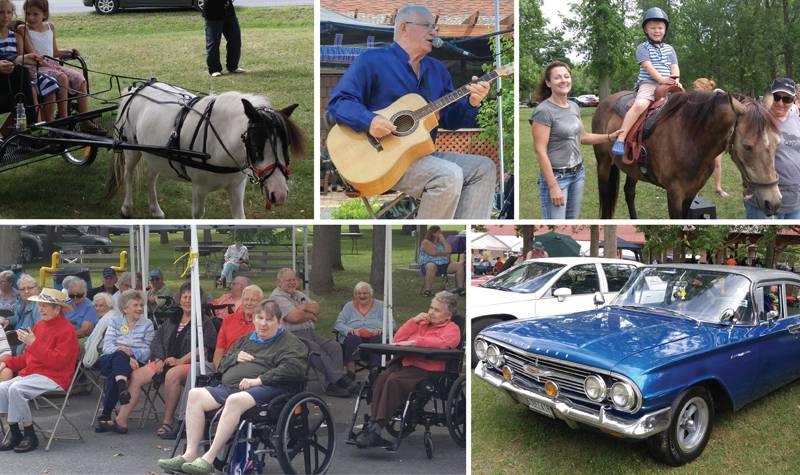 – Woodland Villa’s annual Country Fair saw about 300 people pass through on Aug. 22, a testament to the value the event brings to the small community each year, says Lisa Doran, the home’s life enrichment co-ordinator and one of the fair’s organizers. The event, which celebrated its 13th year, attracted several local vendors who sold their wares at booths. There was musical entertainment, horse and pony rides, classic cars on display, and bouncy castles for young children. The event also featured a silent auction, raffles and a 50-50 draw. The Country Fair ran from 10 a.m. to 3 p.m.
OMNI Health Care’s 18 long-term care homes are working to create stronger community engagement in 2018. The Country Fair is an example of how Woodland Villa has been engaging people living in Long Sault and in the surrounding area for many years, Lisa says. “We have many different vendors here today from the area – some are from Alexandria, some are from Ingleside, some are from Cornwall, and we also have a lot of high-school students volunteering here this year,” she tells The OMNIway. One young volunteer is 14-year-old Owen Araujo. Owen has volunteered at Woodland Villa in the past and says it’s something he enjoys. “It was a lot of fun just setting everything up here today, (and) it’s a way to give back to the community,” he says. Lisa credits the fair’s success to the hard work staff members and volunteers contribute. The stage, tents, tables and barbecues were set up in the morning, and despite organizers and volunteers being temporarily sidelined due to rain, everything was ready by the time attendees began arriving. “All in all, it turned out to be a great day,” Lisa says.